Not many jobs today offer the convenience of working from the comfort of your own home. Content writing, however, happens to count among that minority. Working from home comes with a plethora of benefits – you waste no time commuting, you’re your own boss and can decide when and how long you’re going to work, as long as you fulfill your quota. These benefits are especially desirable if you’re working as a freelancer or only part time. 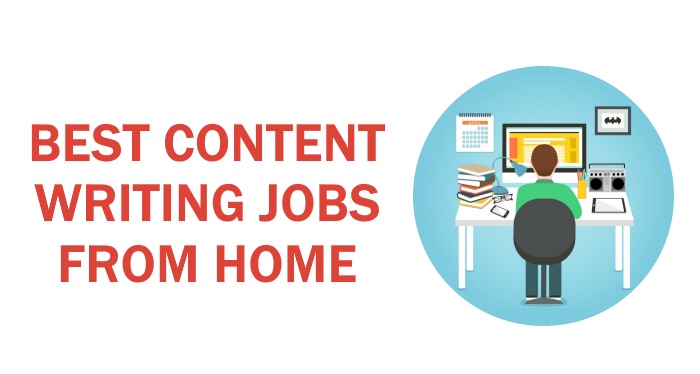 If you wonder what the best content writing jobs from home are, working as a freelancer is the only viable answer. Relying on sites that accept and pay for submissions is way too fickle – it would result in lots of wasted time trying to get published, and even then it will earn you much less relative to the effort you put in. As for in-house writing agencies, while some may offer the possibility of working from home, it is not exactly a common occurrence. Regardless, just getting hired by such a company is difficult enough in itself. Freelancing platforms – these are sites which simply serve as a mediator that connects clients and writers. Here, writers create a public profile and can either apply to jobs or wait for job invitations. When working through these platforms, you are usually paid an hourly rate negotiated with your employer. Content marketplaces – also commonly referred to as ‘content mills’, these are another type of freelancing platforms. What makes them different is the fact that the client-writer interaction is kept at a minimum and the site handles most of the logistics. Here, writers are paid on a per-word basis. This is a less convenient model, as you’re only being paid for the final product, and not for the time you put in doing research or editing. That said, the following list contains 10 of the most ideal options for anyone seeking a content writing jobs from home. We have written a detailed review about HireWriters, which you can read here. HireWriters is an international company that currently offers the services of thousands of writers around the globe, native English speakers or otherwise. That said, registering with them as a writer is simple and free.. Writers are divided into four categories: beginner, general, skilled and expert. These ranks are assigned exclusively according to your experience writing for HireWriters, meaning that your actual skills and qualifications don’t matter. The number of jobs required to be completed is not high, but rating and adherence to deadlines is the crucial determining factor. Lastly, HireWriters pays exclusively in US dollars and via PayPal. The biggest downside to HireWriters is the fact that, for some reason, they only accept writers from the USA, Australia, Canada, United Kingdom, Singapore and New Zealand, which is quite unusual for a company of this type. We have written a detailed review about iWriter, which you can read here. iWriter offers a variety of services, including anything from regular articles to blog posts, press releases and eBooks. As is the norm with sites such as these, writers are ranked as either standard, premium, elite or elite plus, with linear progression and steadily increasing pay. Payments are made only through PayPal and it’s up to writers to decide whether they wish to be paid on a weekly, bi-weekly or on a monthly basis. Ultimately, iWriter puts more effort into Q&A and pays slightly better than its competitors. However, a common downside that is usually the case with platforms such as this is that they’re very customer oriented. What this means is that they put customers before writers and do nothing to protect the latter. All it takes is one capricious client to decide your article is not good enough and reject it, leaving you without the payment which you have rightfully earned, all the while they are still free to use the content you wrote as they wish. We have written a detailed review about ContentMart, which you can read here. ContentMart is another content marketplace that focuses exclusively on content creation. The bulk of their writers are from India, but anyone can register to work through their site, regardless of where they are in the world and regardless of their English proficiency. Furthermore, writers are assigned one of ContentMart’s four writers ranks: standard, experienced, verified and the additional ‘hand-picked’ rank for writers chosen specifically by editors. While their rates are average, their progression system is quite flawed in that it relies almost exclusively on customer ratings. Inexperienced writers might not see this as a flaw at first glance, but there are several: customers can be unreasonable and capricious, and you can be demoted to a lower rank if your stats do not meet each rank’s requirements. OneSpace is a popular platform formerly known as Crowdsource. They have a different system in that they require a subscription to be paid by businesses who collaborate with them. This makes them a less flexible option for buyers but not much so for writers. As a matter of fact, it is more favorable for writers as compared to other platforms since they pay much quicker, in as little as a day of your work being approved. What’s more, they allow writers to set their own rates immediately. There aren’t many downsides to OneSpace at first glance, but many of those who used it have complained about a lack of work, or simply a lack of variety. While it doesn’t exactly enable anyone to get rich or make it a steady source of income, they do provide quick payments, as already mentioned. Pay: Determined by each individual writer. We have written a detailed review about Copify, which you can read here. Copify is a platform focusing primarily on copywriting and content marketing, but they offer other types of content creation services as well. Unlike other ‘content mills’ out there, Copify has a fairly simple ranking system that comes down to two options – standard and professional. The way writers are ranked, however, is more encouraging, as the Copify team determines it based on the quality of the writing. As is almost always the case with sites such as these, Copify pays writers via PayPal. All money earned by a writer can be accumulated on their Copify account until decide to withdraw the funds to their PayPal. One of the primary downsides of Copify is the needlessly short deadlines. Writers are required to start working on orders as soon as they apply, and a deadline for one can turn out to be as little as 2 hours. Naturally, this leaves little room for proper research and editing, and it sort of defeats the purpose of working from home. On top of that, they prioritize quality, meaning that you absolutely must possess English proficiency equal to that of a native speaker. Pay: Starting at £0.04 per word. Zerys is a content marketplace and a subsidiary of InteractMedia which was founded in 2007. Upon registering, writers are required to provide a sample of their work which is reviewed by the Zerys editorial team, and will ultimately determine the writer’s rank. These writer ranks take the simple form of ‘star ratings’. The writers are paid per word, and at a rate determined by clients. However, writers can still set their own rates for direct orders. The payments are made via PayPal on a bi-weekly basis, and at a specific date set by each writer. Even though Zerys is more reliable that a lot of their competition,, there are two main problems with it. Firstly, it is less popular, which results in fewer clients, and fewer jobs in turn. And secondly, the client-determined rates can be a double-edged sword. True, sometimes you may find people who pay more, but it is a far more common occurrence that they will try to pay as little as possible. TheContentAuthority is a content marketplace which employes writers from anywhere in the world, but only after they have thoroughly reviewed their applications. Writers are ranked across ‘tiers’, with all writers starting at tier 1. This rank can be increased only by the editorial team upon their quality control review, which either occurs periodically or upon a writer’s own request. When it comes to payment, it is based on word count and content type and is ultimately unique for each individual order. As for the compensation, writers are paid weekly via their PayPal account. There is only one apparent downside to TheContentAuthority, and that’s the fact that they do not always accept new writers. To be more precise, applications themselves are always open, but the team is not always in the process of reviewing them. Apart from that, SEO knowledge is a must, so you must have that under your belt before you can work through this site. We have written a detailed review about WriterAccess, which you can read here. WriterAccess is arguably the best you can do when it comes to platforms that follow the ‘content mill’ format. They offer writing, editing and translating services, and pay much better than any other similar company out there. All the writers who apply are required to pass an entrance test before being assigned their rating, which ranges from 2 to 6 stars. Sounds too good to be true? It sort of is, seeing as WriterAccess only hires people living in the US. There is no indication as to why this is the case or whether it is bound to change in the future. Nonetheless, if you’re from the US, you could hardly find a better platform. If you’re not, then you have no choice but to turn to an alternative. Textbroker is an international company launched in 2007 and boasts the title of the internet’s first content marketplace. In addition to content writing, Textbroker also offers translation services in over 15 languages. Their ranking system also takes the form of the commonly seen ‘star rating’ which ranges from 2 to 5. Their ranking system inspires more confidence as it is determined by their editorial team, not the clients. And as one of the most convenient international payment options, PayPal is yet again the platform of choice in this regard. Textbroker pays slightly more and treats their writers much better than some of the other ‘content mills’, as evident by the opinions of anyone who has ever worked for them. All in all, they just may be an ideal choice for skilled non-native English writers – the pay which equals pocket money for those living and working in first world countries can amount to a higher-than-average income for those who do not. We have written a detailed review about TextMaster, which you can read here. TextMaster is a relatively young platform founded in 2011 that offers both content creation and translation services. Much like the lower-ranked Copify, there are only two writer ranks – standard and enterprise. They pay noticeably better than their competitors, but also have stricter quality control. As a matter of fact, their ‘standard’ quality writers are all required to produce native-sounding content that includes SEO, while the enterprise option is reserved for highly specialized and technical content. Overall, TextMaster receives positive reviews from people who have worked through their platform. They pay well, especially compared to their competition. The only complaint seems to be the fact that it doesn’t always provide a steady supply of work, and that their stricter quality control leaves little room for error. Content marketplaces do not spell an ideal work opportunity, but are a necessary first step for most content writers. True, they come with many flaws. The pay is generally low, especially for native writers, and it is not uncommon to come across customers who expect perfection for the pocket change which they pay you, or editors which might use cheap excuses to penalize you and lower your rating. But it’s not all that bad! You are always free to apply and work on your own time, on the subject of your choice – and from the comfort of your home. And even though you may find a shortage of work when working through only a single platform, there is nothing stopping you from juggling several at any one time. Ultimately, they can be a reliable source of income only for writers living in second or third world countries. Conversely, for native writers, they can hardly serve for anything more than some extra side-income or a brief stepping stone in their careers. But all things considered, there are two things always guaranteed by these ‘content mills’: you will always be able to find work and you will always be able to work from home.